Garlic and ginger tea is a popular folk remedy for ailments ranging from common colds to high blood pressure. While ginger and garlic both have many healthful properties when consumed fresh, it is less clear whether a tea made from these foods has a beneficial impact on circulatory health. Ginger and garlic tea as a treatment for high blood pressure can also be a dangerous combination if you are taking medication for circulatory or cardiovascular disorders. Garlic -- Allium sativum -- is known for its antibiotic, anti-fungal and health-building properties. Garlic is often used as a dietary supplement to reduce cholesterol and high blood pressure, according to the Scott & White Prescription Services at the San Marcos, Texas, Department of Health. Numerous studies support the proposition that oral garlic supplements may lower blood pressure, reports the University of Maryland Medical Center, but these studies have not considered garlic tea in lieu of oral garlic supplements. Garlic has primarily been studied for potential cancer-fighting impacts of its sulfur compounds, according to the Iowa State University Extension. These health-promoting compounds are not present in intact garlic, but form when fresh garlic cloves are crushed or chopped and exposed to air. These sulfur compounds have anti-bacterial powers comparable to penicillin, according to the Clayton College of Natural Health. Fresh garlic cloves, rather than tea, contain the antibacterial properties. Ginger has been used in traditional medicine in several cultures for thousands of years, according to the University of Texas El Paso. Its use has primarily been directed at digestive disorders, including nausea, motion sickness and loss of appetite. Numerous studies support ginger's effectiveness for these purposes. Ginger increases calcium uptake by the heart, which in turn reduces high blood pressure, according to the Clayton College of Natural Health. However, only fresh ginger produces this effect. The active components of ginger vary widely from plant to plant, so the beneficial effects even of fresh ginger use can not be wholly predictable. Garlic and ginger tea can be used as a treatment for colds and easing the symptoms of flu, recommends the Clayton College of Natural Medicine. This use takes advantage of garlic and ginger's antibiotic and anti-inflammatory properties, as well as ginger's reputation for easing headache and relieving nausea. Since studies regarding these healthful properties of ginger and garlic have focused on consuming the fresh products or dietary supplements, it is uncertain whether a tea made from fresh or dry garlic and ginger would impart the same healthful properties. However, ginger and garlic tea tastes good, especially with honey and lemon, and adds warm fluids to the diet when suffering from a cold or flu. Clayton College does not report that this tea has any impact on blood pressure, but consult your doctor before consuming any home remedy. Garlic and ginger both thin the blood, leading to increased risk of bleeding. Taking ginger and garlic together can interfere with blood clotting, according to the University of Texas El Paso. Neither should be consumed when you are taking other anticoagulants like aspirin or warfarin. Ginger also increases the absorption of other medications, and garlic can reduce iodine absorption, which also interferes with the function of some medications, particularly for thyroid patients. 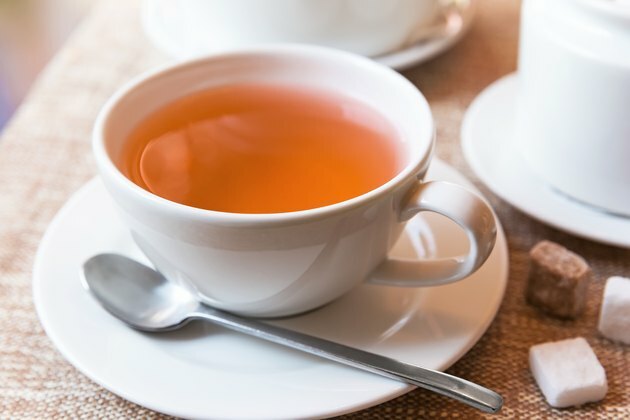 Studies supporting these warnings were based primarily on fresh consumption or dietary supplements, so the effects of garlic and ginger tea on medication interactions are uncertain at best. Consult your doctor before beginning any home treatment for high blood pressure, as consuming ginger and garlic in supplement or tea form may interfere with your medication and create a real risk of health dangers.